On Saturday and Sunday hundreds of people line Lincoln Avenue to witness the Street Events. 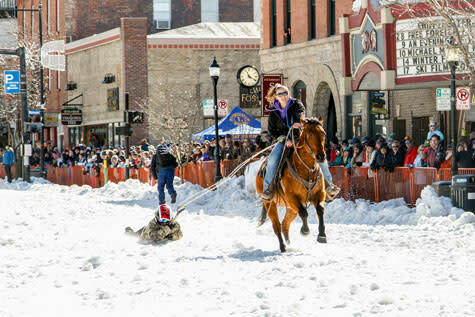 The Street Events are a wildly popular and entertaining show featuring children on skis (or snowboards) being pulled behind horses down a snow-covered Lincoln Avenue. 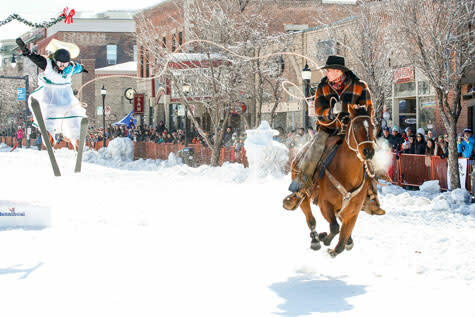 Horse Events include: Street Slalom, Ski Joring, Ring & Spear, Ring & Box, and the famous Donkey Jump. Horse Events are for children ages 6 to 14 years old, while Non-Horse Events are for children ranging in age from infant to 14 years old. Register early for all horse events as we can only accept a certain number of kids in each event and spaces fill early. We try to accommodate as many kids as we can in the time we have allotted for the street events. Registration for the 2020 Street Events will open in January. Registration for the non-horse events will be the day of the event at the registration tent located in front of 720 Fusion Fresh. Contestants must have read through the waiver statement and signed the release. Pre-registration is mandatory for all horse events. Contestants may enter only one (1) Horse Event per day. Contestants may sign up only for events for which they are the designated age. Shovel Race contestants must provide their own shovel. Shovel Race contestants must wear a protective helmet such as a cycling or climbing helmet. For questions or more information, contact Sarah Konopka, (970) 875-7009. Events in bold require advance registration. *On Saturday, the Nordic Council will be putting on a 100 meter Nordic Sprint. This race will start on 6th and end at 8th Street. Please contact the Nordic Council for registration information. The street events will start at 9:00 a.m. as usual. (Ages 6 - 9): Contestant with skis on will have a ring of rope in their hand and will be pulled down main street by a horse. The contestant will attempt to lasso the ring around “Prince” the steer’s head as he/she passes by. Fastest time wins. Penalty for missing the steer. (Ages 6 - 9): Five stands will be located on the street with a ring of rope hanging from each stand. Contestants with skis will carry a spear and attempt to collect all five rings while being pulled by a horse down the street. Most rings collected and fastest time wins. Penalties for every ring missed. (Ages 6 - 9 and 10 - 14): Contestant with skis will race a flat course down the street while being pulled by a horse. Fastest time wins. (Ages 6 - 9 and 10 - 14): Contestant with skis will ski a slalom course through a series of cones while being pulled by a horse down the street. Fastest time wins. Anyone missing a cone or falling during performance will be disqualified. (Ages 6 - 9 and 10 - 14): Contestant will attempt to jump off a 2-foot ramp while being pulled on skis by a horse down main street. Longest distance while maintaining a standing position wins. (Ages 18 and over): Contestants will situate themselves in a shovel of any type and while being pulled by a horse, will race a flat course down the street. Fastest time wins. Anyone falling off the shovel during performance will be disqualified. Waivers must be signed by participants or their guardian the day of the event at the start line. (Ages 5 and under) Children 5 years old and younger compete against one another while being pulled in a sled or toboggan (no metal runners allowed) by the family dog. All dogs must be leashed and led by the parent/dog owner during the dash. Following the dog competition will be the Dad Dash with Dad on all fours pulling the child. First one over the finish line wins. (Ages 5 - 8 and 9-11) Two people on skis tie legs together (ties provided) and race to finish line. The first pair over the finish line wins. (Ages 4-6, 7-10, and 11-14) Contestants on skis maneuver around a variety of obstacles and then make a straight dash to the finish line. First one over the finish line wins. 25 Yard Dash for ages 3-5 years, 50 Yard Dash for 6-8 years and 75 Yard Dash for 9-11 years all on skis. Be on the snow and get the best view of all the action by volunteering at the Winter Carnival Street Events. Volunteers will receive a free breakfast burrito from Creekside Cafe after morning setup. Follow the link below or contact Sarah Konopka 970-875-7009 to sign up. A Winter Carnival button is required for entry and spectating at all events. Purchase a Winter Carnival Button ($10.00) to show your support of the Winter Carnival and the Steamboat Springs Winter Sports Club. 1 Ivy Ladrow 7.75 sec 1 Teddy Haupt Tourigny 37 ft., 11 in. 2 Joseph Lowell 8.0 sec 2 Dylan Kuntz 37 ft., 0 in. 3 Owen DiBiaso 8.31 sec 3 Joseph Lowell 36 ft., 7 in. 1 Nathan Rind 33 ft., 6 in. 2 Hudson Merlina 29 ft., 6 in. 3 Oliver Dalzell 29 ft., 0 in.